Flooding can happen in many parts of the world, and the damages done by these natural occurrences are devastating. It is important to know what to do if you have flooding, because you need to act quickly when water damage is involved. Mould and mildew can grow when there is a damp environment for an extended period of time, so it is crucial to act quickly! If you have a flood sensor you are alerted of unwanted water where it is installed. This allows you to clean up water as soon as it enters your house, before water damages can occur. If you live in an area where flooding is common, these types of sensors are very useful. Investing in a water sensor minimizes your worry regarding house flooding. This is especially if you do not use your basement as much, and might not notice flooding occurring there. Houses can even flood if there is a cracked water pipe due to freezing, or age. You might not be expecting flooding to occur during these times, but a water sensor would alert you immediately if there is an issue! The initial step to take when clearing up a flooded area is to check where the flood damages are the most severe. Knowing what steps to proceed with first would allow you to decrease the negative impact of the flood on your home. Documenting damages can also be important for insurance purposes. Taking some photos and writing details down will help you later on to keep track of what could be covered by your insurance, if you have flood insurance. You should turn off the power to the flooded area for safety reasons. Short circuits are dangerous, and flooded water mixed with electricity is a safety hazard. If the power has gone out, turn off the electricity to the flooded area anyways. It’s important that there will not be any risk of the power turning back on and causing a dangerous situation while you are working. Remove any items that are able to be relocated, and especially valuables. You can place these in a different area to dry out. You can also dry these items manually with towels, place fans near them, or let them dry outside. This gives you more space to work, and drying these items in a different area will decrease the humidity level in your flooded room. Keep in mind that depending on the item and the amount of time it has been sitting in the water, you may need to throw it away. Food items sitting in water may not be safe to eat. You can use a wet vacuum to clear out extra water. For larger quantities of water a sump pump can also be used. You can even use a combination of these items. If water is left sitting for too long, it can lead to mold or mildew. Damages from water can also occur if flood water is sitting in a room for too long. After clearing out as much water as you can using a pump or vacuum, use rags or other cleaning supplies to dry the floor until there is no moisture left. If you have carpeting it should be professionally cleaned and dried (it can contain mould spores) or the carpeting should be removed. Flood water can contain hazardous materials. This water could contain agricultural runoff, debris or garbage. Flood water could also be contaminated by sewage.You may need to clear up any accumulated debris materials outside your house. Bacteria can easily enter along with the water, and it’s important to be aware of the increased risk of transmittable diseases from flood water. These risks are low, but it is critical to keep this in mind and carefully clean the places in your house that came in contact with this water. Using detergent and other soaps will significantly lower the risk of harm to you from the flood water, and will also decrease the chances of mould growing. You may know where flood water commonly enters your house, but if you do not it is important to investigate. Flooding can occur from clogged eavestroughs or even cracks or leaks in the basement walls, or cracks in your house foundation. In addition, soil saturated with water increase the risks of water finding its way into your house to cause flooding. Figuring out where your house might have some weaknesses will allow you to fix them for the future. Use a dehumidifier. To remove any excess moisture from the flooded area, a dehumidifier should be used. 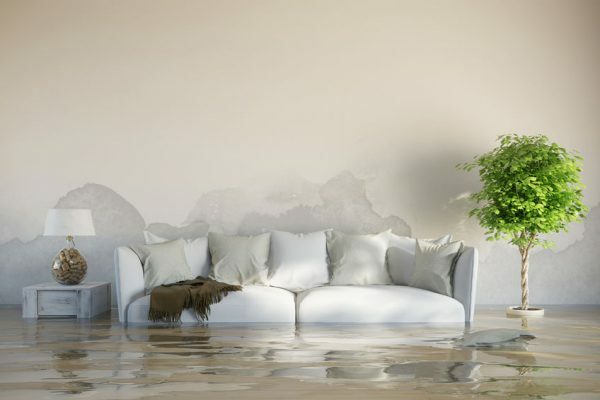 Moisture from the flood water enters the air and can be damaging to furniture and flooring at such a high humidity level. Windows can be opened for extra airflow, and sunlight can also help to dry moisture. However, dehumidifiers do work best when windows are closed. Once it is safe to use electricity in the area, you can use fans to also help dry out the room. Enlist a professional. If there is a lot of flooding and damages, it can be very overwhelming to try to tackle this issue alone. Luckily there are many experienced professionals who can help you! You can get help with walls, floors, or even ceilings that have been damaged by water. These experts can also identify any issues that you may have missed, including potential for problems with mould. Flooding can be very stressful to deal with, and having someone who is knowledgeable about exactly what to do in your particular situation can be a valuable asset. Finally, flooding can be a difficult experience, but you knowing what steps to take will help you to clean up quickly and minimise your stress levels, and maximize your confidence while clearing up and returning to your day-to-day routines.